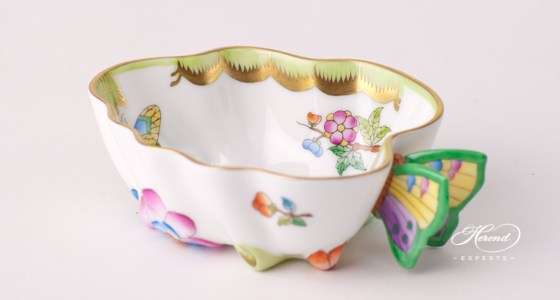 Herend Crash Course – compose your set! In the beginning, You decide what you really want to have – let’s say a Coffee set. To help the decision making, we pre-composed sets for 2 and for 6 persons, so it makes it a bit easier to pick one. Later, I’m going to explain all the tricks of each items, but before that we need to make some basic decisions. I am sure this is quite evident at the beginning already. Our Customers do fall in love with one or another pattern (e.g. 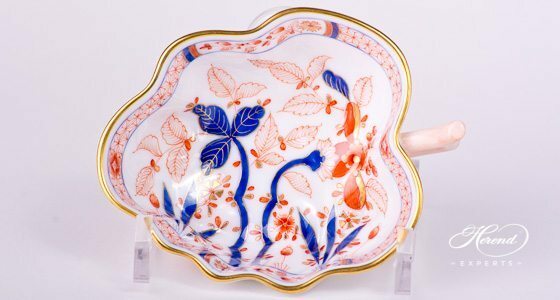 : Rothschild, Apponyi, Chinese Bouquet, Queen Victoria, etc.) immediately. Price is mainly designated by the decor, so this becomes an important point. Rich painted porcelain costs more, but less painting can also give a real elite look. If you made up your mind, our next step is the main form variant. Theoretically, all the patterns can be painted on all the forms. But you need to consider that some forms goes much better with some decors. To achieve a real Royal look, we offer it along with the Shell relief (Rocaille). As for the Rothschild, Queen Victoria the Lisse form is not a good choice at all. Sounds a bit complicated? No worries! We’ll help you along the way, support the decision making with photos and tips via e-mail. For 2 or 6 Persons? Or something else? Of course, we show you all the options. Some of our Customers chooses bigger items, others buy for example two milk jugs or creamers instead of one. The reason is – they say – two tiny looks nicer than one big creamer. The final choice is yours. How this all works in reality? Usually, either the Customers come into our shop or they send us a message. If you’re in our shop it makes it much more easier. You can choose your favourites immediately. When you mail us we start to clear up all the questions. We send photos about of the variants and step by step we build up together the desired set. The next section is about the Coffee pot. 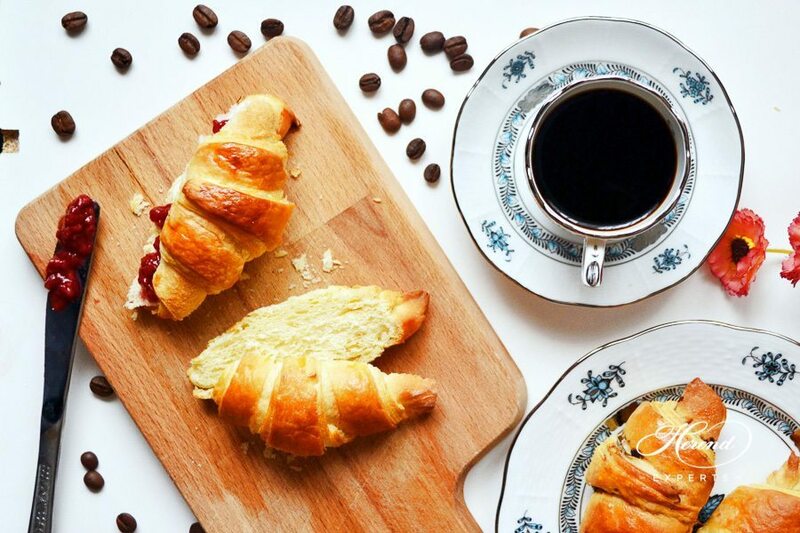 How many guests or coffee lovers you need to count with? If you choose a set for two persons can you piece it out with two more cups? If you buy a set for two persons you may purchase additional items later as well. Because buying two extra cups is really not an issue, but to buy a second Coffee pot. Also consider that Coffee pots are the most comfortable to use up to 8 dl (deciliter) (27 OZ). If you choose a larger one that will be too heavy to use. For example: A Coffee pot with the volume 1.2 liter (40 OZ) weighs 0.75 kg. The weight of the filled Coffee pot is: 0.75 kg (fine china) + 1.2 kg (coffee) = 1.95 kg. This is too much already to handle easily. Here you have the options to choose by size from 2 dl (6.7 OZ) up to 1.2 liter (40 OZ). For two persons: a Coffee pot with the size between 4 dl (13.5 OZ) and 6 dl (20 OZ). For six persons: a Coffee pot with the size between 8 dl (27 OZ) and 1.2 liter (40 OZ). As described in an earlier blog post, the bigger piece is not always more expensive than the smaller one. The price changes as the amount of painting rises. 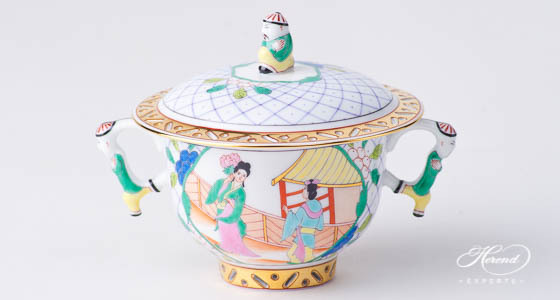 The price of the item increases with the growth of the amount of painting on the fine china. Do not forget, simple decors are also extremely aesthetic. Depending on the decor you choose, it may have rich painting or it rather is more simple. And also sometimes a simple, clean design with the perfect porcelain shape is more elegant than a rich painted colourful one. Just a remark: Some of our Customers bought a bigger and a smaller Coffee pot or Tea pot. They use the smaller one for breakfast and the bigger pot when guests are coming. The next section is about the Coffee cups. Well, yes the Coffee cup is the most important part of the selection. 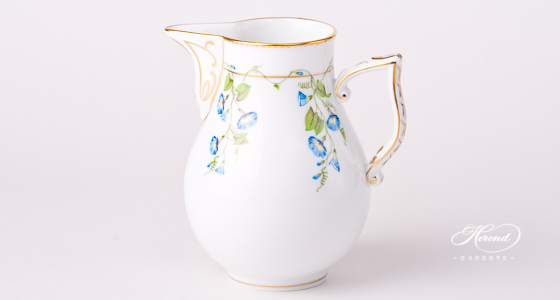 Here we offer regularly the 706-0-00 and the 730-0-00 porcelain forms of Coffee cups. Both of them are 2 dl (6.7 OZ). Here you can’t make a bad decision. Both are great forms. It is absolutely up to your personality which one you prefer. I’m going to add some photos about the products to help you decide. 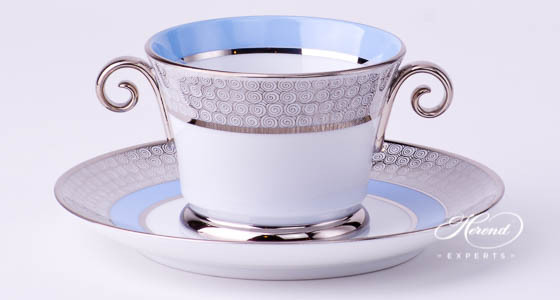 The small volume Mocha cup / Espresso cup offer is 709-0-00 and 711-0-00 porcelain forms. Both of them are 1 dl (3.3 OZ). You might think that choosing a Sugar bowl cannot be a real issue here. However, this is not the case. There are several options regarding size and forms. 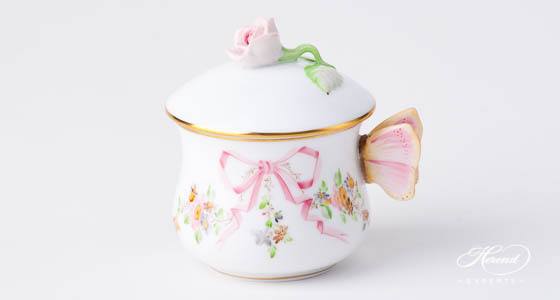 The smallest Sugar bowl is shaped like a leaf and it is an open Sugar bowl. 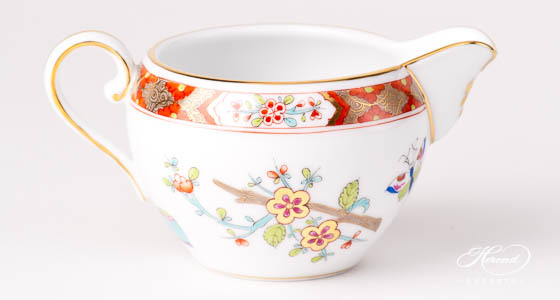 Customers mainly choose this for Mocha sets or for two people’s sets – both coffee and tea. 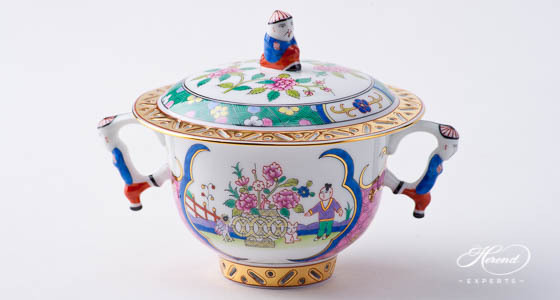 Middle-sized Sugar basin usually covered with a lid. 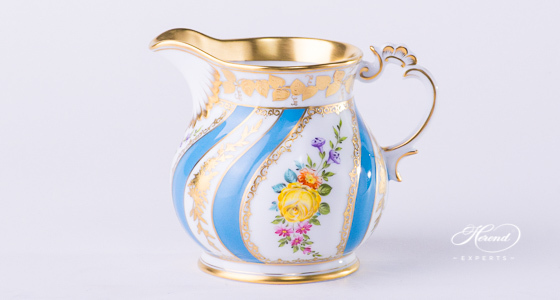 Rose knob – invented by Herend! These are usually used on Bonbonnieres. If you really like one of these, do not hesitate to send us a mail. When you decide the knob, it is strongly recommended to have the same knob on all the elements. This way your set will be aesthetic. Whether the pattern defines the knob or the other way around, you should pay attention to match the two things together. For example in case of the Apponyi pattern you should not use the Bird knob. 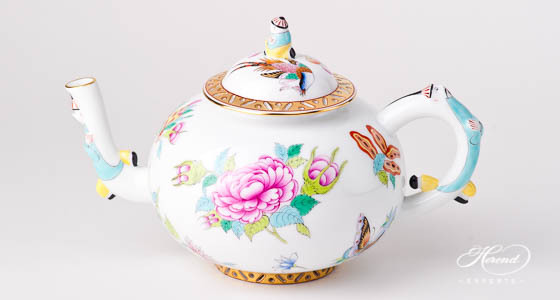 Bird knob looks the best if the fine china is colourfully painted. Rothschild Bird pattern with green fish-scale (RO-ETV) or Hunter Trophies pattern (CHTM) goes well with the Bird knob. 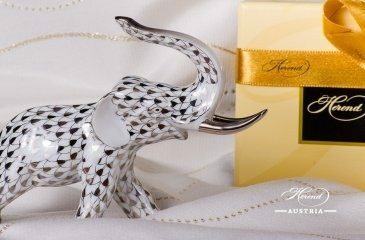 Some of our Customers choose Bonbonnieres instead of Sugar basin which allows them to choose among a wide range of shapes and sizes. 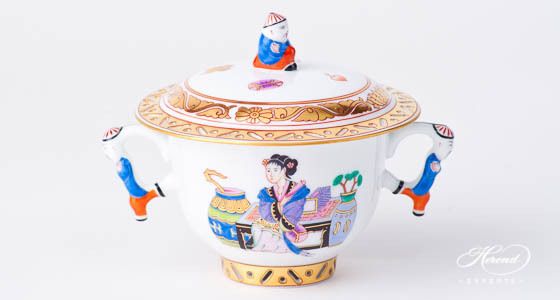 And of course they are nice, multi-purpose porcelain items. As you can see, you have a wide variety of Sugar basins. No matter how you decide, all of them are real artworks. This choice is much more about you: how you like your morning coffee – with lots of sugar or plain black. Milk jugs are for Coffee and Mocha sets. Just like Coffee pots, these Milk jugs have taller forms. Creamers on the other hand are going better with Tea sets as their shape is smaller roundish. 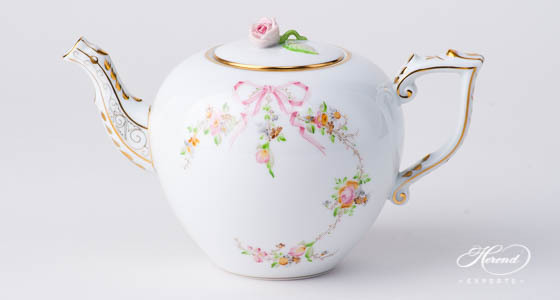 Just like a Tea pot. This is the easiest part. If you like to drink coffee with lots of milk, pick the bigger ones. Lots of our Customers take the 1.1 liter (37 OZ) and 1.3 liter (44 OZ) Milk jugs for fruit juice. Not a big fan of milk? No problem at all! Then take a small creamer! The dessert plate is one of the biggest surface in the set. Therefore, it can change the whole style of the set. When the Customer asks for a Dessert plate, we always show them the traditional ones, but also let them see the modern unicolor (monochrome) edge plates. 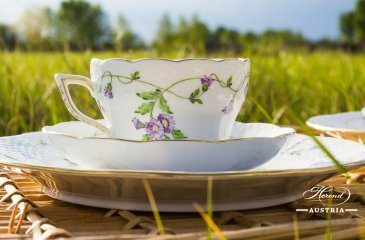 These plates are refreshing, clean spots of the set which helps to bring more attention to the cups and to the coffee pot. Every pattern has the colour variant that suits it the best. 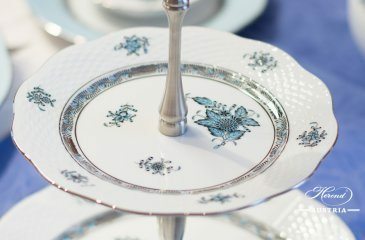 In classical cases, the pattern of the Dessert plates was the same as the other porcelain items in the set. 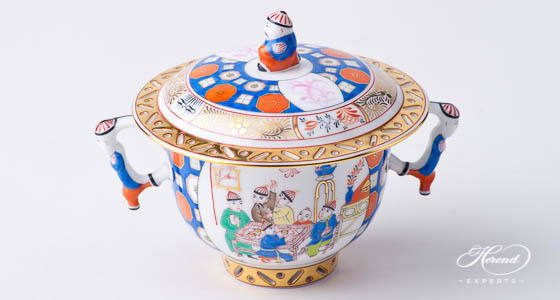 In nowadays, it is more and more popular to choose a different simpler pattern then the main pattern is or only painted it with an unicolor wide edge. These patterns differ from the main patterns, but these are simpler patterns and aesthetically fit. The unicolor plates have special impression. The sets with a more relaxed, less „tense impression” are very popular. They are using this solution increasingly for Dinner plates and Serving plates as well. The sets with a comfortable impression like this are available and purchasable on favourable prices. Usually, we recommend the 16.5 cm (6.5″D) and the 19 cm (7.5″D) variants as they can be used for breakfast sandwiches and for afternoon cookies as well. Our Customers are happier with this one, but in the end you need to know which suits better your ideas. Don’t forget, the smaller plates look nicer with tiny cookies and macaroons, the bigger ones are good for multiple doughnuts. 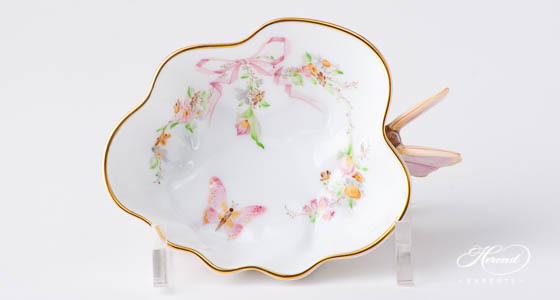 Earlier, we did not recommend the platter as a “must” to Tea and Coffee sets. However, all the Customers who see in real life such a platter, asks for it immediately.